The Chevy Volt is not a real electric car. General Motors alone stands to pick up orders for at least 12,000 Volt plug-in hybrids in a deal that is likely to be much-discussed at the annual Los Angeles Auto Show, which opens this week. Proponents of what industry insiders refer to as “electrification” see GE's move as just the breakthrough battery cars need. Fleet buyers, rather than retail, may be the force that gives the nascent green technology the momentum it needs to reach critical mass, said Robbie Diamond, CEO of the Electrification Coalition, a trade group. “Fleet owners and operators,” he said, following the GE announcement, can “lead the way in this transformation…to accelerate the development of electric vehicles. But GE’s decision to start with the Volt isn’t being universally applauded. Not only are major competitors, such as Nissan, with its new Leaf battery-electric vehicle, left out, but so were the many fledgling battery car wannabes who will be exhibiting their own wares alongside mainstream makers like Chevy, Nissan, Toyota and Ford at the L.A. Auto Show. In a potentially industry-changing David-vs.-Goliath battle, fledgling makers such as Amp, Aptera, Think, Tesla and Fisker, among others, are betting they can take on the well-funded giants who have long dominated the automotive market. “It’s the first time where that’s been possible in more than a half-century,” said Jim Taylor, a former General Motors executive who has served as general manager of both the Cadillac and Hummer brands and is now a board member for Amp. That Ohio-based manufacturer will bring its modified version of the Chevrolet Equinox to L.A.’s Staples Center for the show. Amp removes the original gasoline engine and replaces it with its proprietary lithium-powered driveline. Amp’s strategy is to avoid taking on the Goliaths directly. Instead of modifying, say, the compact Chevy Cruze – which is quite similar to GM’s Volt – Amp turned to a bigger crossover, something most conventional makers like Chevrolet have steered clear of because it would require a lot more batteries. Atlanta-based Wheego, on the other hand, believes it can compete more directly with the big guys – but by following a more Silicon Valley-style approach. It has limited the size of its internal development team and instead partnered with outside contractors to hold down costs. “This is a market sector that is very much contingent on new technology, unlike the combustion engine segment, where there hasn’t been a truly significant breakthrough in half a century," says the startup firm’s CEO, Mike McQuary. McQuary doesn’t believe traditional automakers are nearly nimble enough to adopt such a low-cost business strategy. There seem to be as many unique business models as there are new battery car startups. Canada’s Azure Dynamics is focusing on converting light and medium-duty trucks, such as the Ford Transit Connect Electric, which will begin field testing in the coming weeks. Curt Huston, the company’s chief operating officer, says Azure Dynamic’s focus is also on fleet sales, rather than the retail side. A critical factor, he adds, is the firm’s close relationship with Ford Motor Co., which is providing the Transit Connect gliders that are being converted to battery power. The executive agrees with the view of Ford Chief Executive Officer Alan Mulally, who is betting that few, if any of the battery car Davids will be able to knock down the industry Goliaths. Silicon Valley-based Tesla Motors, arguably the best-known of the new battery car startups, has apparently taken Mulally’s concerns to heart. The company, founded by Internet pioneer Elon Musk, initially came to market with a low-volume, high-priced sports car, the Tesla Roadster. 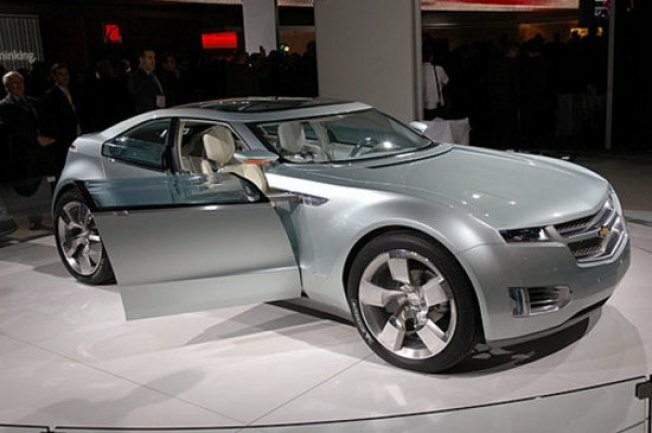 Starting in 2012, Tesla plans to move more mainstream with the Model S sedan. But Tesla is also forming a series of alliances with several well-known Goliaths. It has been assisting Daimler AG in developing electric car programs for the German maker’s Mercedes-Benz and Smart car brands. And, earlier this year, Tesla announced an alliance with Toyota, which hopes to regain its early lead in the green market –something threatened by the Japanese maker’s initial reluctance to embrace lithium battery technology. Toyota not only has invested $50 million in the California battery car maker but turned to Tesla to help develop the RAV4 EV. A lithium-powered version of its compact crossover, it will also debut at the Los Angeles show — and then go into production by 2012. With those tie-ups, contends Aaron Bragman, an automotive analyst with HIS Global Insight, Tesla, “has made itself much more viable, long-term. Like many observers, Bragman says he remains skeptical about the viability of electric propulsion, overall, particularly when it comes to the consumer market. But there’s a real potential among fleet buyers, he adds, who are more likely to have a clear understanding of their daily driving requirements — and a significant desire to curb fuel costs. Which, if any, automaker will make the battery market pay off remains to be seen, and it’s far too early to tell whether it will be David or Goliath who can claim victory.